Installing a hot-water heater in new construction is simplified because there are no previous installations that might have been done incorrectly, or that may have damaged portions of the structure. Building plans will also have set aside the needed space and specified the materials for the connections. It is often problematic, though, to replace a hot-water heater because of the variables of the previous installation. In both cases, there are some minimum requirements for doing a proper job. Gas and electric hot-water heaters have similar requirements. Water heaters get heavy once they are filled with water. A 40-gallon tank will hold about 330 pounds of water. That weight also is not spread out over a very large area, so you need to make sure the floor where the tank will set is solid enough to support it. When replacing a water heater, it is not uncommon for the floor beneath it to have been wet at different times. Check to make sure the floor is still strong enough for the load. Gas-fired hot-water heaters require a vent that allows combustion gases to escape. The vent goes through the ceiling and eventually to the outdoors through the roof. There needs to be a clear space above the hot-water heater to the ceiling so nothing will touch the vent pipe. The pipe needs to attach to the top of the heater. Electric hot-water heaters do not require a vent pipe. Each hot-water heater has a pressure relief valve. Sometimes these are on the top of the heater, other times they are on the side. The pressure relief valve must have a drain pipe connected to it that will carry the water that it may release either into a nearby drain, or outside the building. A gas-fired hot-water heater needs a supply of natural gas, or propane. You adapt natural gas hot-water heaters to accept propane by changing the orifice. Gas heaters can also be ordered with the correct orifice for propane. A natural gas supply will arrive inside the building through a pipe that is attached to a gas meter outside the building. Propane also arrives through a pipe but most often the pipe travels from a propane storage tank somewhere on the property. Electric hot-water heaters need an electrical cable to supply power to them. Most of these heaters are 240 volts. The cable that supplies the power originates at the electrical service entrance panel where it is connected to a two-pole, 30-amp breaker. 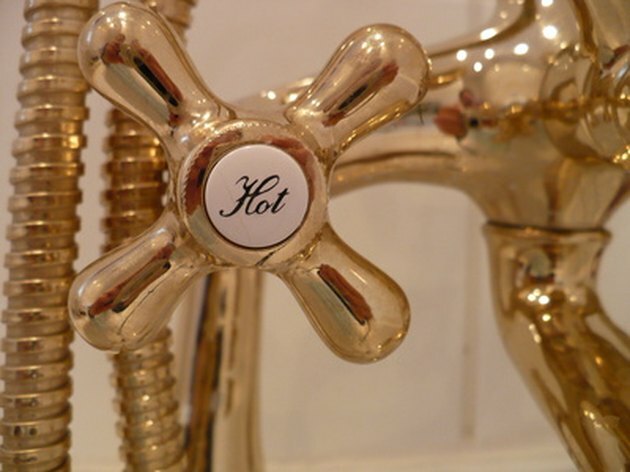 Small electric hot-water heaters usually only need 120 volts. The service panel end of their wire will be connected to a single-pole, 20-amp breaker. Each water heater needs to be connected to a cold-water supply line that carries cold water into the tank. The tank also connects to a pipe that carries hot water to the building's plumbing fixtures.